Rescue doesn’t wait for the ice to melt. 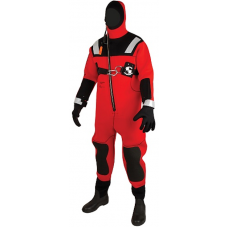 For situations when harsh, icy conditions are unavoidable, get the Stearns® Ice Rescue Suit. ✔ Made with 100% closed-cell neoprene and featuring a built-in chest harness with stainless steel D-rings for improved lift assistance and added clip-on storage, you’ll be ready to tackle even the most formidable outdoor rescue scenarios. ✔ 3M™ Scotchlite™ SOLAS-grade reflective strips increase visibility and five-fingered gloves allow for maximum dexterity while thick-soled, heavy- tread boots provide sure footing—even on ice. ✔ Multiple ice pick pockets on wrist and torso areas fit all brands of ice picks, providing quick, direct access to tools when you need them. ✔ Reinforced knees and elbows ensure comfort and durability, and the off-set zipper on face guard better protects the skin from wet, freezing weather. Break the ice – and protect yourself while you’re protecting others – with the Stearns® Ice Rescue Suit. STEARNS VERSATILE™ VEST When you’re looking for all-around, high-vis..
I810 STEARNS RAPID RESCUE EXTREME SURFACE DRY SUIT Achieve durable comfort in the wat..
I652 STEARNS VR2 RESCUE VEST Make sure you have the right gear at the right time with t..
2000023989 SWIFT WATER INFLATABLE RESCUE BOARD Equip Your Swift Water Rescue Team with ..
MUSTANG ICE COMMANDER RESCUE SUIT IC9001 The Mustang Ice Commander™ ..